If you’re looking for smarter ways to use content technology in your marketing, I hope that this story inspires you as it has me. It’s about two of my colleagues at the Content Marketing Institute – IT Director Dave Anthony and E-media Manager Laura Kozak – who put heads together to automate a tedious, unscalable website task, saving Laura time and improving the experience for the CMI audience. Here’s the short version of the story. Dave and Laura figured out how to automate a task that had been getting more and more painful to do manually. 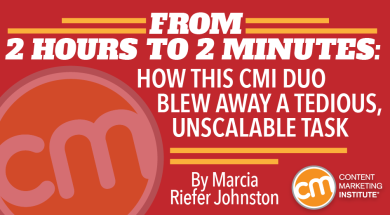 Every other month, when a new edition of CMI’s magazine, Chief Content Officer (CCO), came out, Laura would drop everything and spend nearly two hours updating the CMI website. As part of the running conversation Laura and Dave had for a couple of years about automation opportunities, they took on the challenge to streamline the CCO updating process. Her bimonthly effort now takes two minutes. This project is about more than a specific pain point. It’s the outcome of a mindset. Since joining the CMI team over a year ago, after working as a technical writer for over two decades, I’ve been looking for marketing stories involving intelligent content – the back end of content strategy. Most intelligent content examples come from technical-communication departments (documentation, support, and training). Those examples, however worthy of attention, don’t resonate with marketers. Marketers need stories that they can map onto to their own goals, processes, and tools. Dave and Laura’s story comes straight out of content marketing. Their implementation details look nothing like the DITA/XML details I’m familiar with from my tech-com experiences, but the underlying principle remains the same: When you put computers to use doing what they do best, you free up people to do what they do best. The bottom-line impact in this case is small. In itself, the time Laura saves every two months isn’t exciting. (Well, it is exciting to her and Dave. “Dave saved me,” she says – to which he replies, “Laura’s the real hero. I’m just pushing buttons until cool things come out.”) What’s exciting for the rest of us is the promise that automation holds for streamlining our own content processes. OK, now for the story. Read on to find out what Laura used to do, what she does now, and how Dave applied intelligent content principles – with a little help from WordPress and some PHP scripting – to practically eliminate her task. “The old way was such a drain on my time,” Laura says. 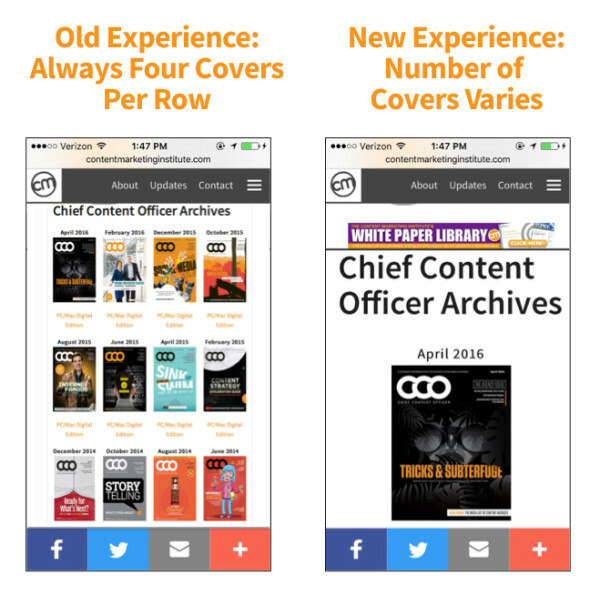 Every time a new edition of CCO came out, she went into the WordPress administrator interface and updated three CMI web pages. Under the circumstances, she was making the updates in the most efficient way possible. The task typically took almost two hours. Here’s what she used to do. 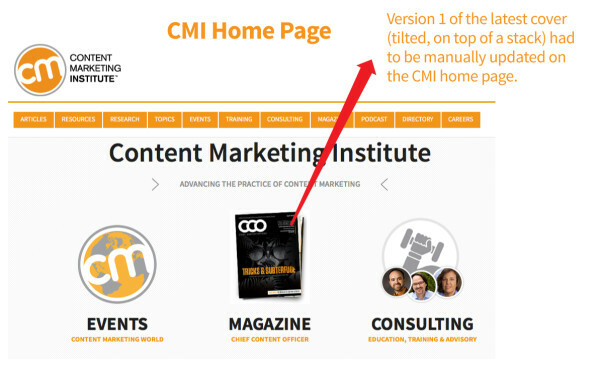 She opened the CMI home page and swapped in Version 1 of the new CCO cover: tilted, on top of a stack. “I didn’t mind swapping in this image,” Laura says. The home page’s unique setup made this edit trickier than it would have been on a simple HTML page, but this step in itself didn’t take her long or cause her much pain. 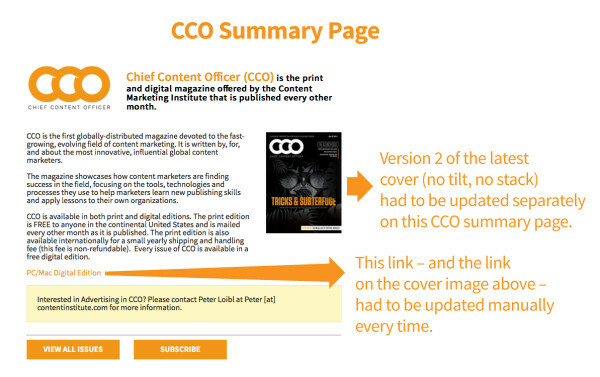 She opened the CCO summary page and swapped in Version 2 of the new cover (no tilt, no stack) and, in two places, updated the link to the new edition. Like the home page, this page (a simple HTML page) took little time to edit. “It was just one more thing on my list,” Laura says. 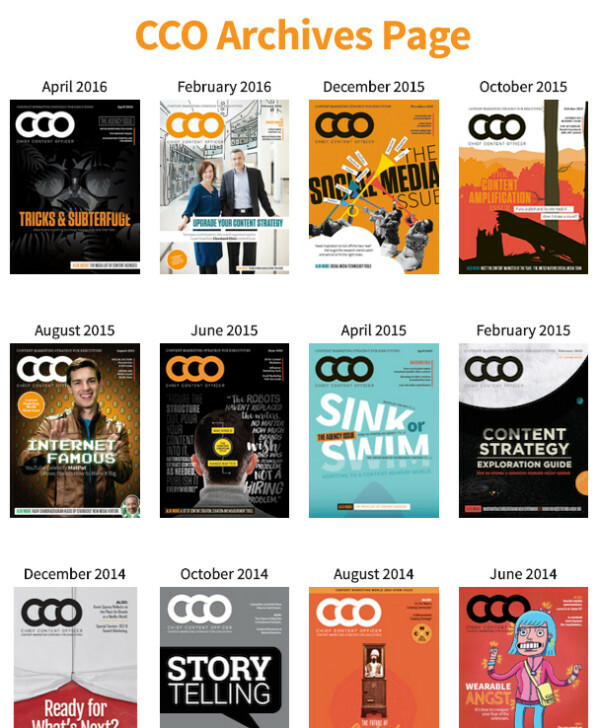 She opened the CCO archives page and added the latest cover to the prime spot – top left. On a good day, if I did everything perfectly with no distractions, this table took me a half hour. Usually it took more like an hour because I messed up. I pasted something too far down or lost track of where I was and had to start over. It was a nightmare. And the nightmare grew less and less endurable as the number of covers steadily increased. To make matters worse, Laura could do none of these three steps ahead of time. Either she dropped everything else to make the updates on publication day or she handled the chore belatedly. Today, thanks to Laura and Dave’s collaboration, whenever a new CCO edition is ready to publish, Laura has to enter only a few bits of information – on one screen, at her convenience. No need to edit multiple web pages. No need to cut and paste. No need to drop everything else on the day of publication. What used to take her up to two hours to accomplish now takes her two minutes. She sets the “schedule for” date. All information to update the website for this CCO edition is now in one place. In other words, when Laura saves each new edition’s post, that behind-the-scenes post becomes the single source for all the data needed for that update. When the go-live date arrives, WordPress pulls the information from this behind-the-scenes post into all three user-facing web pages – CMI home page, CCO summary page, and CCO archives page – automatically. Dave’s good at taking a step back and looking at the larger process. He takes my requests and one-ups them. He gives me solutions I hadn’t even dreamed of. I ask for a, and he gives me a, b, c, and d.
You can see the full PHP script in black-and-white TXT form here. You can see the two relevant parts separately, in color, below. Anyone can create a custom post type. 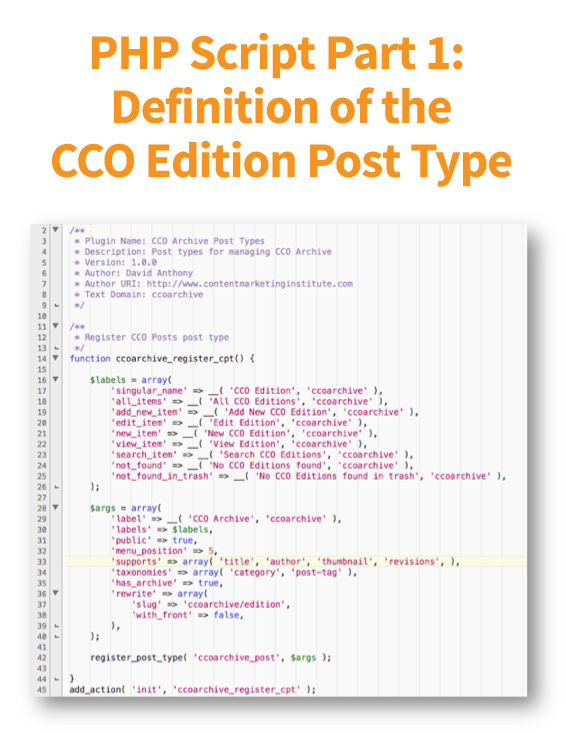 The CCO Edition post type that Dave created for Laura enables her to simply fill in some data in a few fields (as shown above) instead of updating three HTML pages manually each time a new CCO edition comes out. 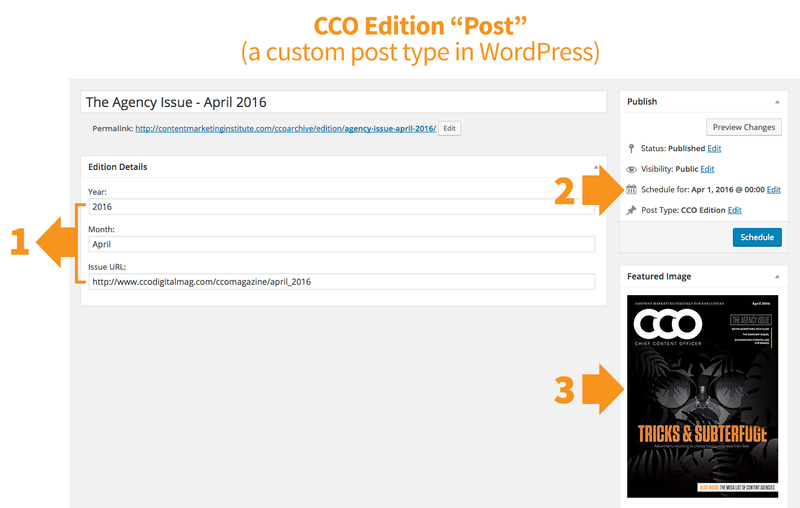 The second part of the PHP script constitutes the layout loop – a dozen or so lines of code that enable WordPress to lay out the magazine covers on the CCO archives page automatically. The layout loop generates fresh HTML code whenever someone visits the CCO archives page. Well, not every time. People occasionally see a cached version of the page. You get the idea, though: The page is now created on the fly. 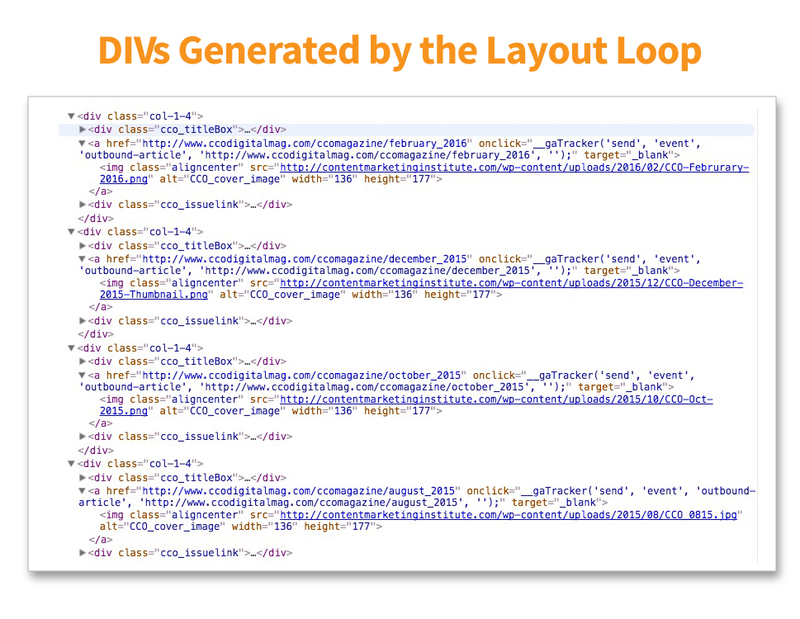 The old static table with its four cells per row has been replaced by a dynamic set of DIVs, shown below. For Laura, this approach means no more cutting and pasting; the layout loop does all the work. Users get a better experience, too. Unlike the old table rows, which always displayed four covers in a row no matter how squished they might get, the DIVs display either four covers in a row or one cover at a time – depending on the size of the browser window or the screen – thanks to the responsive-design instructions Dave added to the cascading style sheet. Dave and Laura’s collaboration reduced her bimonthly CCO-updating effort by something like 98%, essentially blowing away the task. If you read this whole article, you know how they did it. You also know that, as often happens with intelligent content approaches, users ended up with a better experience as well. What are your own versions of Laura’s CCO update? What time-sucking manual tasks keep you from doing what your business most needs from you? What sympathetic IT colleague might help you automate those tasks, freeing you up to do more creative work? I hope that Laura and Dave’s story inspires you to explore these questions. As you do, you may find yourself in the happy position of having to answer this question: What will you and your content team do for your organization with your new-found time? Want to boost your content marketing strategy skills or knowledge? Sign up for our Content Strategy for Marketers weekly email newsletter, which features exclusive insights from CMI’s chief strategy officer, Robert Rose. If you’re like many other marketers we meet, you’ll come to look forward to his thoughts every Saturday.